New Prey Trailer Details Alien Monsters | Nerd Much? After all that exciting gameplay preview at Prey‘s event, I didn’t think Bethesda would give us anything exciting for much longer. I am happily wrong, as this new trailer explains all the alien enemies you’ll be dealing with. And likely inadvertently all the cool abilities you’ll be getting to fend them off. Stick a needle in your eye and evolve today! This new trailer features Mimic, Weaver, Phantom, and Telepath. Mimic we’ve met before a few times, this alien can turn itself into any inanimate object of equal size and mass. Otherwise it “devours organic matter,” so we should all be glad a space ship is generally made of some kind of metal. You can’t tell a mimics changed from unless you shoot first, though I’m sure there is some subtle visual tell to help players along. 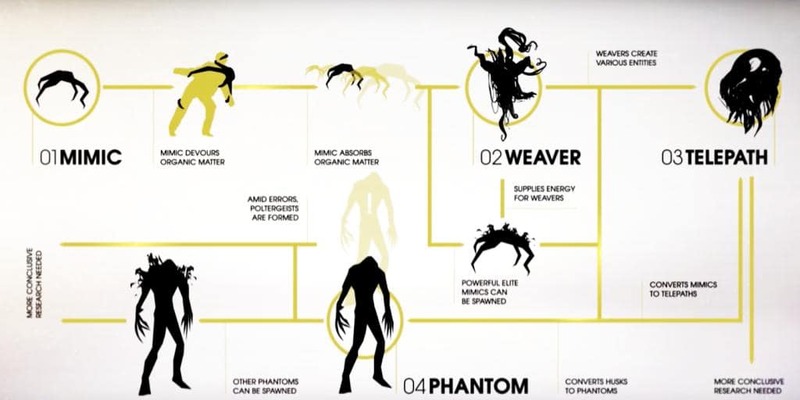 The Phantoms are created by Weavers, using human corpses. They can sound like humans, even coming up with disjointed phrases, but apparently nothing comprehensive. The narrator in the trailer emphasizes that Phantoms are definitely not human and you must attack them on sight. The Telepath is also the most dangerous out of all them, as it preys on the weaker minded folk. Presumably to kill them, but the research doesn’t mention any further details other than attacks and defenses. Don’t forget, this awesome looking game comes out May 5th 2017 on the PS4, Xbox One, and PC. What do you think of these enemies? Let us know in the comments below!